You’ve made an investment in a pool. Shouldn’t you be able	to use it, even when it’s not sizzling hot outside? Solar pool heating	extends the usability of your swimming pool without adding to the costs	of pool operation. Thanks to solar water heating technology, you and your	family can enjoy a comfortable pool at any time. Why should you choose solar pool heating? 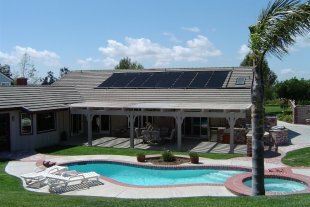 If you’re in the market for a pool heater, then going solar is a	no-brainer. What are the advantages of choosing a solar pool heating system? Saving you money: Once the solar heater is installed, your heat is FREE from the sun. With	a gas heater you could pay the gas company as much as $300 a month to	comfortably heat your pool. You’ll be saving on your utility or	electric service bill. Non-polluting: Our systems generate and utilize energy that is clean, renewable and	reliable. It will help eliminate carbon dioxide emissions and reliance	on fossil fuels, which are a major contributor to global climate changes. No maintenance needed: Once installed solar pool heaters require little to no maintenance. They	also work with most existing pool pumps. Warranties are 12 years and collectors	can last 30 years or more. Increase value of your home: Recent studies show that homes with heated pools and solar equipment installed	increases a home’s value. Control overheating: In hot climates, the summer heat can actually cause your pool’s water	to be too warm. A solar pool heater can also cool your pool during hot	summer months, which gas heaters cannot. Q: Is a solar pool heater better than a gas heater? We think so. A solar pool heater can be less expensive up front than a	gas heater, depending on the size of your pool. Once a solar pool heater	is installed, your heat is FREE from the sun. Also, solar is non-polluting,	and it can COOL your pool during hot summer months, something NO gas heater can do! Q: How do I compare a gas heater to a solar pool heater? First, check the operating costs. Will you really be willing to pay the	gas bill, or will you shut off the pool heater when you need it most? Second, ask about annual maintenance costs. Solar has none. Also, determine	the life of the system. Solar pool heating systems can last 30 years. Lastly, what are you really trying to accomplish with a pool heater? If	you want your pool to be a comfortable swimming temperature all season	long, then choose solar. Solar Lights & More is an exclusive distributor of	FAFCO pool heating systems, ranked number one in the industry. On top of producing high quality,	reliable solar heaters for pools, you receive a	full 12 year	warranty and limited	lifetime warranty! Are you ready to enjoy your pool year round with minimal cost? Then get	in touch with our team for your own pool solar panels. With over 23 years	in the solar business, you can count on us to setup your solar pool heating	system to run for years to come. Call	Solar Lights Inc. of Ocala today at (352) 690-9664 for a	free solar consultation!